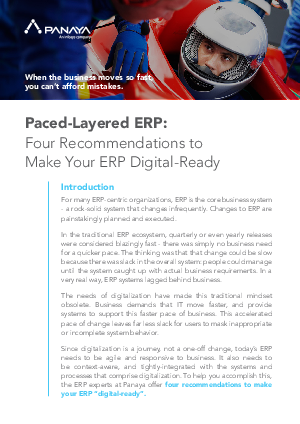 > Panaya > Paced-layered ERP: 4 Recommendations on making your ERP "Digital-Ready"
For many ERP-centric organizations, ERP is the core business system - a rock-solid system that changes infrequently. Changes to ERP are painstakingly planned and executed. In the traditional ERP ecosystem, quarterly or even yearly releases were considered blazingly fast - there was simply no business need for a quicker pace. The thinking was that that change could be slow because there was slack in the overall system: people could manage until the system caught up with actual business requirements. In a very real way, ERP systems lagged behind business. The needs of digitalization have made this traditional mindset obsolete. Business demands that IT move faster, and provide systems to support this faster pace of business. This accelerated pace of change leaves far less slack for users to mask inappropriate or incomplete system behavior. Since digitalization is a journey, not a one-off change, today’s ERP needs to be agile and responsive to business. It also needs to be context-aware, and tightly-integrated with the systems and processes that comprise digitalization. To help you accomplish this, the ERP experts at Panaya offer four recommendations to make your ERP “digital-ready”.